Paratha is a kind of stuffed Indian flatbread and Aloo, or Alu, is potato. It is stuffed with a spicy potato filling, it is delicious when eaten with butter or dipped in yogurt sprinkled with salt and pepper. It is popular for breakfast and may be served for langar during early morning worship, following an all night kirtan vigil, or on any special occasion in Punjab. Mix flour, salt and water together to make soft dough (if the dough is hard add a little more water). I like mixing the dough by hand. Knead the dough for a few minutes on a lightly greased surface to make smooth and pliable dough. Set the dough aside and cover it with a damp cloth. Let the dough rest for at least ten minutes. Boil 2 medium potatoes with 2 cups of water. After the water comes to a boil, reduce the heat to medium. Let the potatoes cook until they are tender. Once tender, remove them from the water and let them cool down. Note: Do not cool the potatoes under running water because the potatoes will become too soft. After the potatoes are cold enough to handle, peel the skin off and mash the potatoes. Mix green chilies, cilantro, cumin seeds and salt to the mashed potatoes. Divide the dough and potato mixture into 6 equal parts. The potato balls should be about 1 1/2 times larger than the dough balls. Roll the dough into 3 inch diameter circles. Place the potato balls in the center. Seal by pulling the edges of the rolled dough together to make a ball. Proceed to make all six balls. Let them settle for 3 to 4 minutes before rolling them. Heat the skillet on medium high. Note: An iron skillet works best. To check if the skillet is hot enough, sprinkle a couple of drops of water on it. If the water sizzles right away, the skillet is ready. To make it easier to roll the balls, first roll them in dry whole-wheat flour. Lightly press the ball on the sealed side and keep it on the topside when rolling. Roll the ball light handed in to 6-inch circles. Whenever the dough sticks to the rolling pin or rolling surface, lightly sprinkle dry whole-wheat flour on both sides of the semi-rolled paratha. Place the paratha over the skillet. After a few seconds you will see the paratha change color and puff in different places. Then flip the paratha over. You should see some golden-brown spots on the topside. After a few seconds, spread 1 teaspoon of oil on the paratha. Again, flip the paratha and lightly press the puffed areas with a spatula. Flip again and press with the spatula making sure the paratha is golden-brown on both sides. Cool the parathas on a wire rack so they don’t get soggy. Parathas can be kept outside for up to 2 days wrapped in aluminum foil or in a covered container. 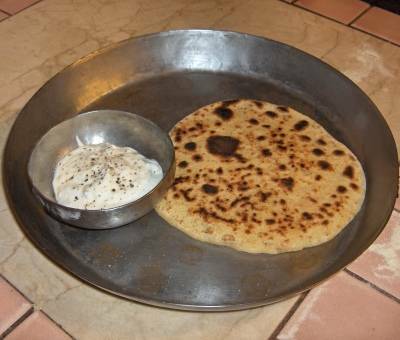 For later use, parathas can be refrigerated for 5-6 days or freezed (wrapped in aluminum foil) for a month. Re-heat on a skillet or toaster oven. Parathas can be served with tomato chutney, plain yogurt, any gravy subji, or spicy pickle. Make it like a Mexican Quesadilla by topping it with cheese and sliced tomatoes, then folding it in half.